We all know that hard jerkbaits will catch bass when conditions are right. But we also know that they are finesse or light tackle lures in most cases. True, there are a few bigger ones, heavier ones and ones that run deep. However, those baits are the exception rather than the rule. 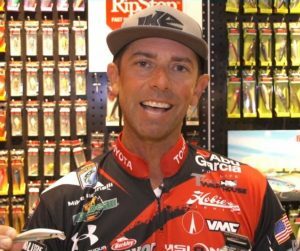 Rapala has corrected that issue with their new RipStop. You’ll remember that the original RipStop was revolutionary in its design. The lip on its tail made a bait that didn’t glide forward on the twitch. It stopped on a dime and, in many cases, actually backed up a little ways. The importance of that can’t be overstated. If he or she is in front of the lure, off to the side or underneath it, when the lure is twitched it doesn’t glide forward. It stops or backs up. This makes it look like forage that has seen or sensed the predator bass and that is trying to decide what to do or to get away. And, if the bass is following the lure it looks like something is moving towards it. Either way, in bass land that’s called an easy meal. 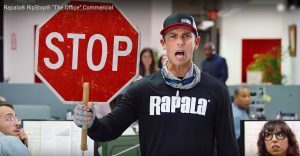 Rapala has done the exact same thing with the new RipStop except that it’s bigger and heavier. Basically, it’s designed for power fishing. Its size designation is a No. 12. That makes it 4 3/4 inches long whereas the No. 9 model (original) is 3 1/2 inches long, and it weighs 1/2 ounce as opposed to 1/4 ounce. Along with those changes the No. 12 comes with three sets of treble hooks, all are No. 5 VMC designs. This sets it apart from the No. 9 model which comes with two sets of treble hooks, one a No. 6 VMC and the other a No. 7 VMC. The only thing that’s the same between the two is that they both come in 14 super effective colors. I’ve worked on, or at least seen, all of them and they are super good. I take advantage of that by picking out one that matches the local forage wherever I’m fishing. If power fishing is your thing, I suggest you pick up a few before your next fishing trip. They’ll come in handy when you get a jerkbait bite going especially if you’re after bigger bass that are feeding on bigger forage.